I have more money than I have ever had since playing this game; 17.7mil! And now that I Have all of this I do not really need it like I did when I was leveling up characters every day. I could Never win enough battles to win the Fleet Ability Mats Challenges, but I Bought some Fleet Purple Mats recently in the Shop, and now I am Finally winning them! I just hate that the Best Dark Side ships, Slave-1, Kylo Ren Command Shuttle, Tie Advanced, Tie Reaper, et. al., are So Hard to Farm! And I noticed something; Toons in the "Shipments" section are farmed out at 5 shards per time, whereas Ships are only 4. No wonder it has taken sooo long to farm ships, whereas I now have almost Four Complete Squads (19) of 7* Toons! Buy mods with credits. A good mod (5 dot, with secondary speed showing or primary speed arrow) will cost like 4 million credits and then another 500k to upgrade. Burn thru 17 million quickly. @amaze122 Ship farming is slower for the rare ships in the top middle spot of the fleet arena store (TIE Advanced, Slave One, Scimitar), so it’s a good idea to buy those ships whenever you see them. Also, if you want specific ships, you can look into where they can be farmed. One of the ships in your picture, Cassian’s U-Wing, is actually the easiest ship to farm in the game, since it’s in the cantina store. And two of the ones you mentioned, TIE Reaper and Kylo’s Command Ship, are on hard nodes that also contain valuable characters (Shoretrooper and Darth Sion, respectively), so they’re worth farming. The most important thing, like with all areas of the game, is to focus on which ships you want to improve and then gear up the pilots and improve the stars, abilities, and levels of both the ship and pilot(s). Tie Advanced, Slave I and Scimitar all have a node on the new Fleet Battles table so they've got a little easier to farm than they were. Tie Advanced, Scimitar and Slave I show up rarely in the Fleet store so it's worth holding back 400/800 tokens to pick up when they are there. Scimitar is also available in Guild Event Store semi-frequently. taking a step back can certainly be helpful if you're feeling overwhelmed or stressed out, though it does come with the price tag of falling (further) behind in terms of progression, be it in arena or guild content. Still - ultimately it's a game, and if slowing down makes it more fun, then that's the right move. Trystan makes a good point that you should play how it’s fun to you. The game can take up your entire day (and/or your entire paycheck) if you let it, so it’s good to have a good balance. If you’re happy with where you are and how you’re progressing, that makes the game more fun! I always wondered if it was worth it to buy shards from the Shipment Store with crystals instead of farming for them, especially at the rate of 640 for 8 being offered. Of all the articles that I have searched this one wins hands down for laying it all out in a way most easily understood. Now I can make a truly informed decision! Hey amaze! I saw you in my ally list the other day and was glad to see you were still active. When I first got all of my Nightsisters up to gear XII plus, I immediately went from getting 1,7 million in the Pit Raid to 10,334,000, apparently the highest one can get since I have not seen anyone get above that as a score. But.....the next five times I fought, I got to right at 3 million, and then there would be a great "Whoom", and my characters had suddenly gone from Full Health to Obliterated!? Does Anyone out there know what is happening? You may have hit enraged. After the rancor takes a certain number of turns, your characters get healing immunity and the rancor deals greatly increased damage. This is why teams that have turn meter reduction do well in raids like rancor, so he doesn't get turns. 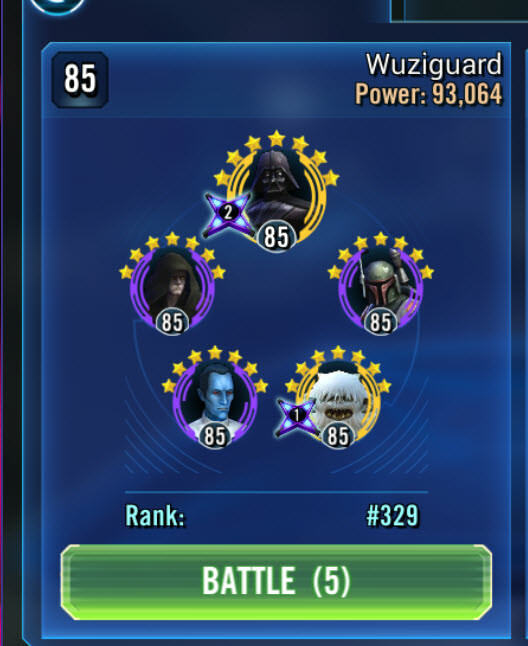 If running Nightsisters, using a zeta Ventress lead is good for this reason. The second time you may have just had worse luck as the tm reduction has a percent chance to apply. It's also possible you used a different leader besides Ventress the second time. I am using Talzin lead at present. You know, maybe I was using Ventress at first, that is a distinct possibility. I will test this out on the next Raid, which will be...I don't know, but we just had this one a couple hours ago, so...a few days, at least. Thank you in advance, that may be it! From memory 3 million in pit is probably phase 1 and most of phase 2. You get a new enrage timer when you start a new phase. If you are hitting enrage just before the end of a phase it could have been rng the first time. Or it could indeed be the change in leadership.